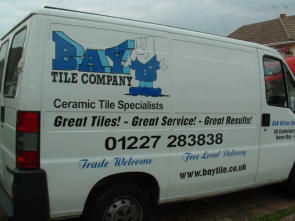 Wat Tiler The series was commissioned to advertise the new 'Bay Tile Company' shop. Only two episodes have been produced so far, but if the shop does well, they'd like to sponsor a series. A first for me - they're based on authentic D-I-Y hints! The name, of course, is from our local hero and leader of the Peasants' Revolt, who lived in Dartford, his home now being the Wat Tyler pub. The B/W version is from the original artwork. The color (well, blue) version is taken from Wat's first appearance, in the 3rd October 2003 issue of the 'Herne Bay Extra' free newspaper. They did the coloring! There is also the second, last and final episode of Wat Tiler, together with the additional version. This time, the Blue version appeared in the free glossy magazine, 'Focus', distributed in Darkest Kent and dated November 2003, coincidentally exactly twenty years after twenty years before it was published.